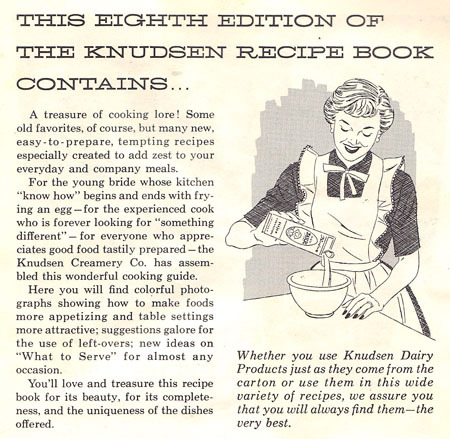 Cookbook #199: Knudsen Recipes, Knudsen, Knudsen Creamery Co. of California, 1955. 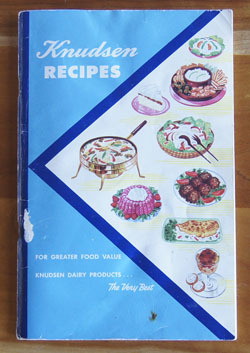 This is the second “Knudsen Recipes” cookbooklet that I have covered. 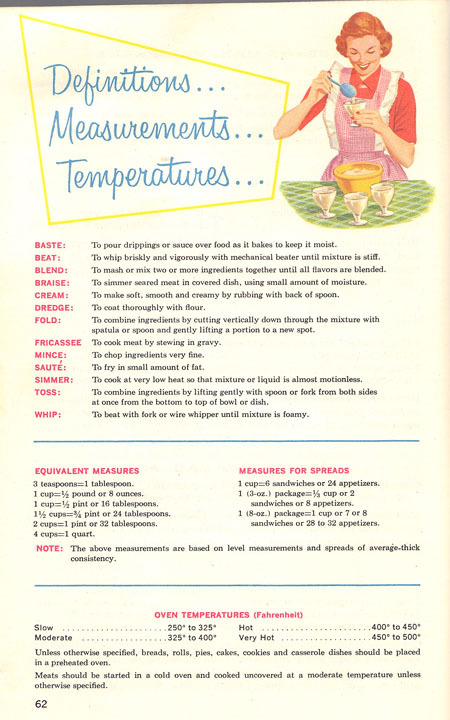 I didn’t much like the recipes in the first one I covered, the 1953 version. In fact, I couldn’t find a single recipe to try in that version! This one is a lot better. I’ll give some examples below. But first, a review. 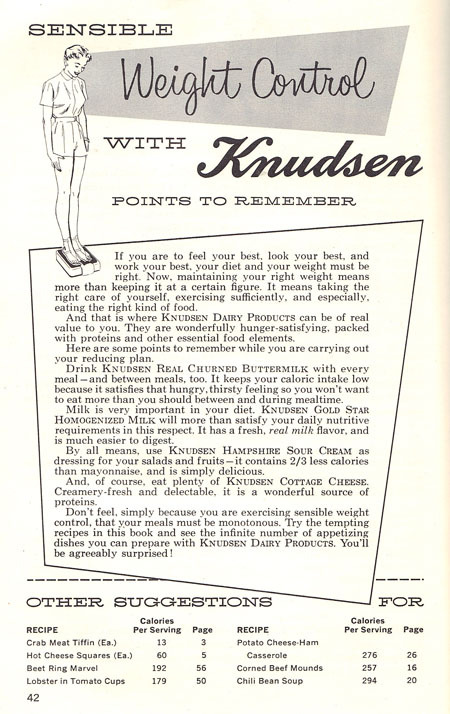 “Knudsen” is a California dairy product company, currently owned by Kraft Foods. 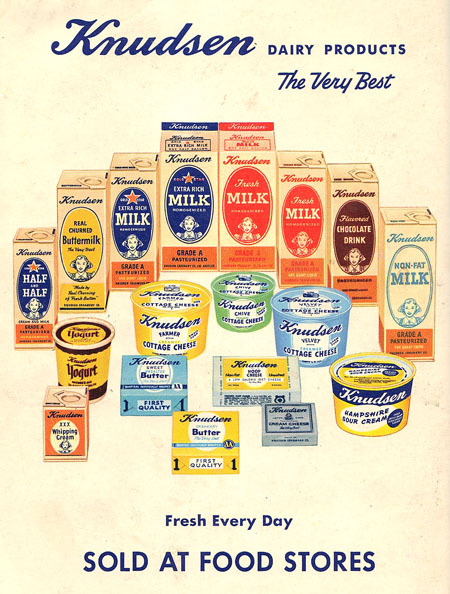 Knudsen-brand products are still available in California and even in some of my local supermarkets here in Colorado. 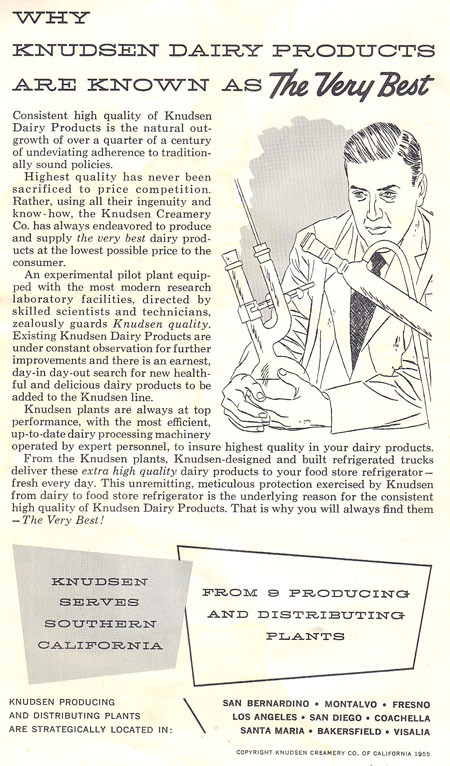 In 1955, they were quite proud of their high quality and modern research facilities. Note the illustration below. A chemist (male, of course) holding a round bottom flask with a claisen adaptor and a distillation apparatus. Dessert recipes come next. 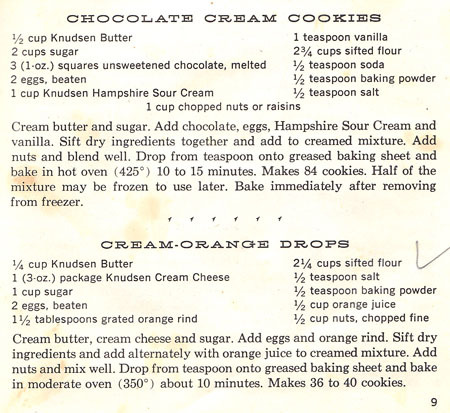 I like the recipe for “Chocolate Cream Cookies” (with sour cream) and Cream-Orange Drops (with cream cheese). On to main dishes. “Liver Loaf” with liver, salt pork, bread crumbs, and cottage cheese doesn’t sound good to me, but it illustrates how popular organ meats used to be. 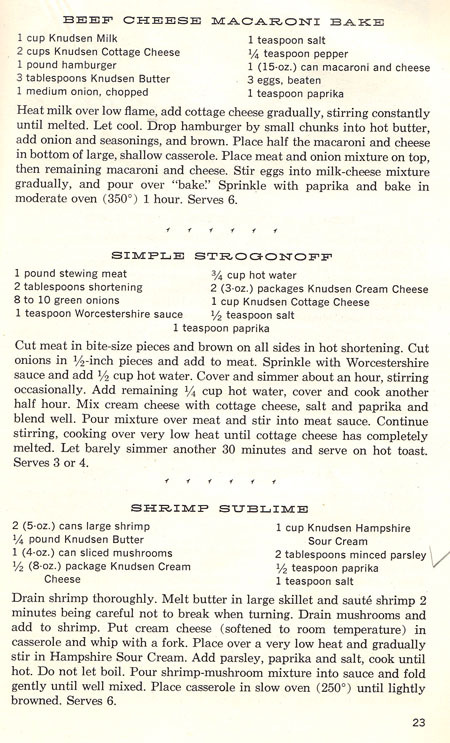 The page below illustrates some of the main dishes: canned macaroni and cheese with milk, cottage cheese and hamburger; stroganoff with cottage cheese and cream cheese rather than sour cream; a shrimp dish with canned shrimp. The “Crab and Shrimp Bake” (below) is made with cooked shrimp “cut in bits’ and crab meat, cottage cheese, sour cream, celery and onion and green pepper, and potato chips. I don’t know, does it sound good to you? 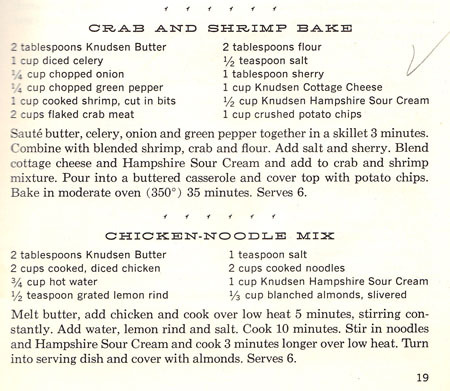 I do think I’d probably like the “Chicken-Noodle Mix”. Below is another page of main dish recipes. 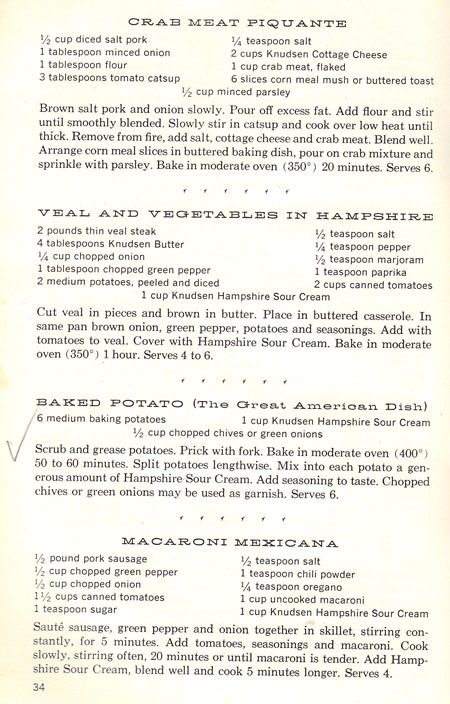 Note the “Baked Potato” recipe. Haven’t seen this recipe for awhile – baked potatoes with sour cream and chives. That was always a standard at our house and was often offered at restaurants. In fact, when they’d ask if we wanted butter or sour cream and chives, we’d say “both”. I think we sometimes made a mix of butter, sour cream, cream cheese, and chives (or green onions) to put over baked potatoes. 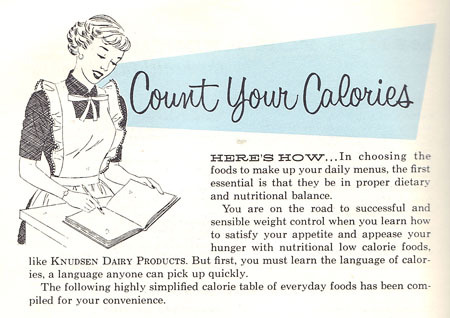 The next page is “Menus for reducing”. Example, for lunch, you get 6 celery rings (celery with Bleu cheese, cream cheese, and sour cream), a small glass of buttermilk, one soda cracker, 1/2 teaspoon of butter, one cookie, and coffee with half-and-half. Egads! you could skip the silly single soda cracker and the sugary cookie and have something whole grain instead, and put skim milk in your coffee! Where is the protein, except in the milk products? 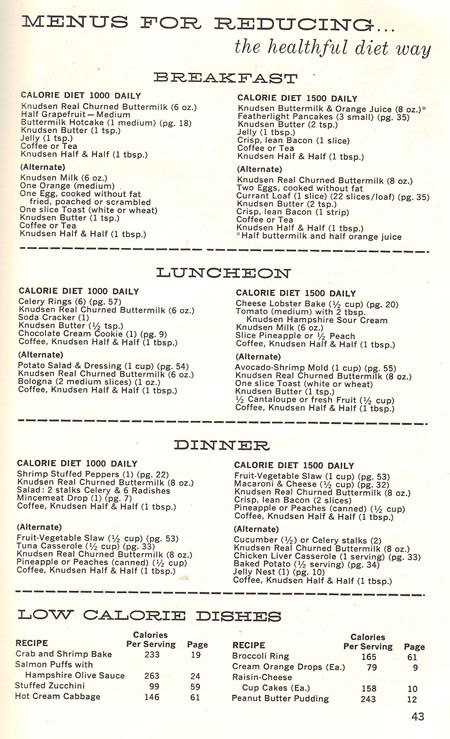 And note the low-calorie recipes at the bottom of the page, with the 243 calorie peanut butter pudding (vanilla pudding mix, peanut butter, and cottage cheese). After the menu planning and dieting sections, Knudsen Recipes goes to salad recipes: molded salads with cream cheese and cottage cheese and fruit, avodados with cottage cheese, broccoli with cream cheese. 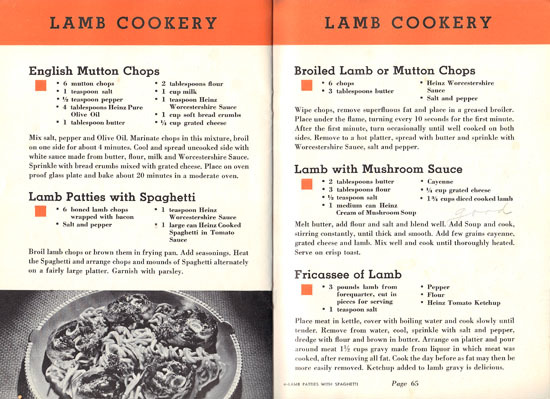 Not many of these recipes interest me, other than as nostalgia. I like the page below for two reasons. For one, I like the illustration of the housewife. For two, I like the table of “oven temperatures”. Many times I have run across a recipe in an older cookbook that says simply “cook in a hot oven” or the like. This table will help me convert old recipes to current oven settings. 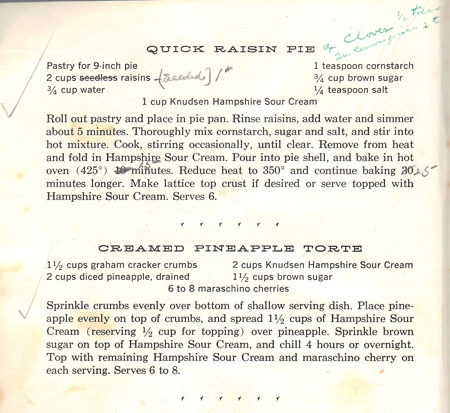 If you would like to see more of this cookbook for yourself, I found a digitized copy of this book on the HathiTrust.org site: the record and the full digitized view. I decide to make “Chocolate Cream Cookies” for this blog. The scan of the original recipe is above in this blog, page 9. Below is my updated version of this recipe. Cream the butter and the sugar on high speed. Add the eggs one at a time and beat until well mixed. Add the chocolate, and then the sour cream; mix in on medium speed. Combine the dry ingredients and add slowly until all of the flour is incorporated. Add the nuts and mix in. Drop dough from a teaspoon onto a baking sheet. (I used a sheet of parchment in my half-sheet pan.) Bake at 375˚ for 8-12 minutes. Here are my cookies. I took them to share at my Lyons Garden Club meeting. These cookies are very good! Kind of a subtle chocolate-y flavor in a soft cookie. The sour cream does make these cookies stand out amongst all the other chocolate cookies I have made. I baked the first batch as directed at 425˚ for 10 minutes. I could smell them burning and sure enough, the bottoms of this first batch were burned. I lowered the oven to 375˚ for 10 minutes for the rest of the cookies. I suggest peeking at the first batch at 8 minutes though, as all ovens vary a bit. I made the dough for these and kept it in the refrigerator, making cookies “as needed”. As the original recipe states, you could probably freeze the dough with success. 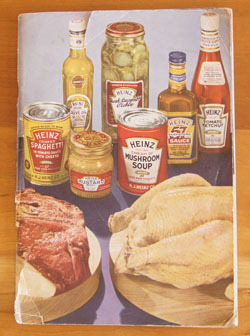 Cookbook #198: The Heinz Book of Meat Cookery, H. J. Heinz Company, Pitsburgh, Penna., 1937. Sounds like today’s natural food claims. Let’s see, does the bottle of Heinz ketchup (I always choose Heinz ketchup!) in my cupboard still lives up to this claim? 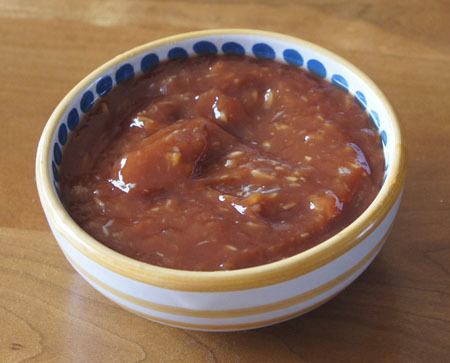 Judge for yourself – here is the list of ingredients for Heinz Tomato Ketchup (“grown not made”): tomato concentrate from red ripe tomatoes, distilled vinegar, high fructose corn syrup, salt, spice, onion powder, natural flavoring. No preservatives, but high fructose corn syrup instead of pure granulated sugar. 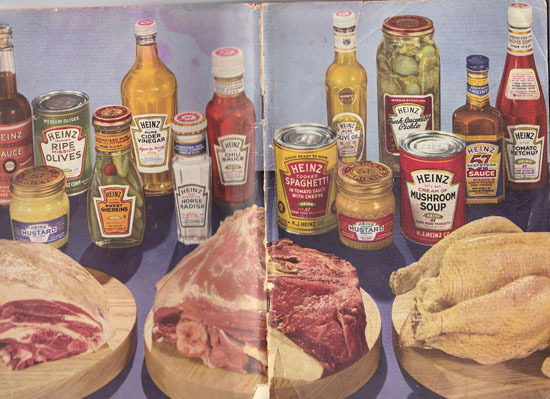 Heinz is one of the longest-running food companies in the US. (I’ve covered quite a few of the American brands because a large portion of my cookbook collection is manufacturer’s cookbooks.) 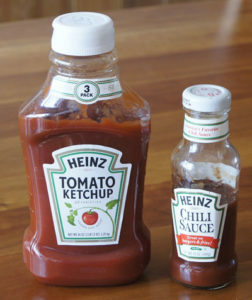 Established in 1869, Heinz remained a company under that name until 2013, when it was purchased by Berkshire Hathaway and 3G Capital, resulting in the Kraft Heinz Company. Accoding to Wikpedia, this company is currently one of the 5 largest food companies in the world. 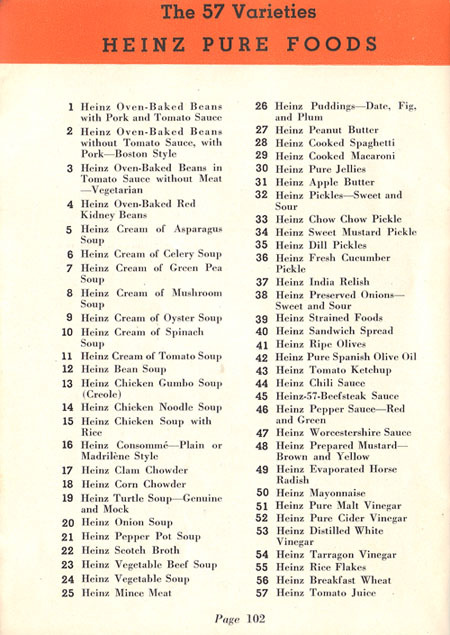 Heinz brand products have a “57” on the label – the Heinz “57 Varieties” slogan. 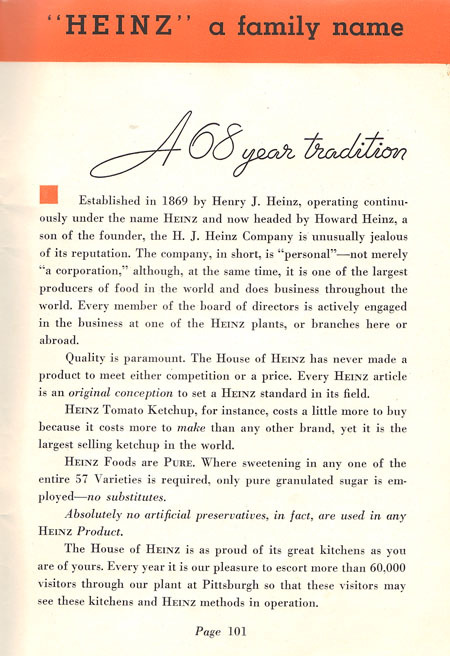 Excerpted from Wikipedia, accessed 2017: “Henry J. Heinz introduced the marketing slogan ’57 Varieties’ in 1869 [although over 60 varieties were offered at that time]. He later claimed he was inspired by an advertisement he saw while riding an elevated train in New York City (a shoe store boasting ’21 styles’). The reason for ’57’ is unclear. Heinz said he chose ‘5’ because it was his lucky number and the number ‘7’ was his wife’s lucky number. However, Heinz also said the number ‘7’ was selected specifically because of the ‘psychological influence of that figure and of its enduring significance to people of all ages’.” Now, “57 varieties” is a general term for a mixed bunch, like a mutt dog. 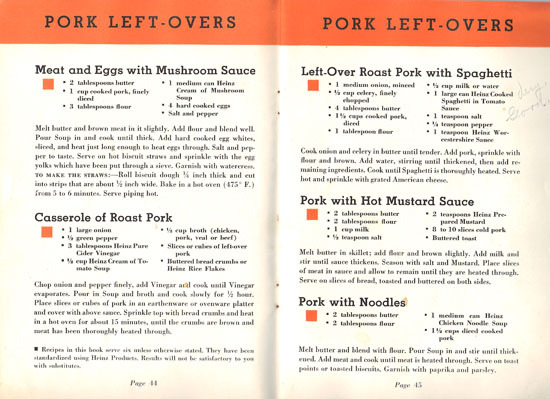 Note the “Left-Over Pork Roast with Spaghetti”. It calls for “Heinz cooked spaghetti in tomato sauce”. Even if I could find canned spaghetti, I would not make myself eat it. 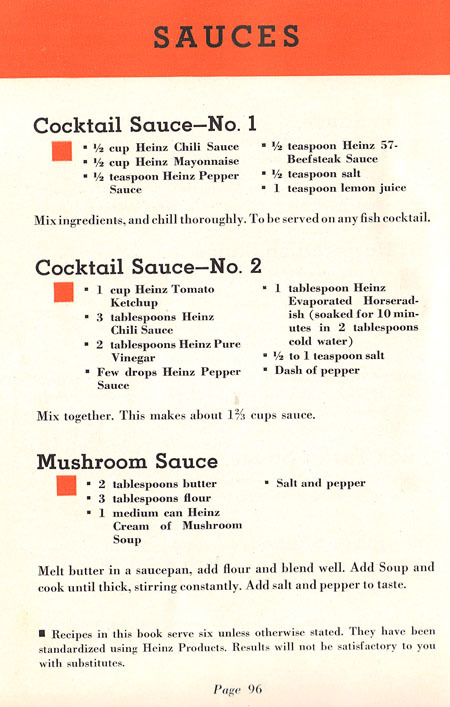 I like the “Cocktail Sauce–No. 2”. This is how I usually make cocktail sauce, except I use lemon instead of vinegar (and I never measure anything!). I like to add a little Lea and Perkins Worcestershire sauce, a current Heinz brand, so I’ll add a few drops. I’m not sure “evaporated horseradish” is available; I’ll use prepared horseradish. This is a good sauce for dipping shrimp. I don’t keep bottled cocktail sauce in my pantry, because it is so easy to make. In the below version, I’ve halved the above recipe, and it made enough to dip about 2 pounds of cooked shrimp. Mix all the ingredients. Taste, and adjust seasonings if desired. Yummy, as usual! Nice excuse to get some cooked shrimp from Whole Foods. I’ll keep this cookbook, but this time I will shelve it with my other “vintage” cookbooks! Cookbook #197: The Glucose Revolution Pocket Guide to Losing Weight, Kaye Foster-Powell, Jennie Brand-Miller, Stephen Colaguiuri, and Thomas M.S. Wolever, Marlowe and Company, NY, NY, 2000. My Whole Foods basket overflowing with fresh fruits and vegetables, I rolled towards a sample table last Thursday. The enthusiastic young man had laid out samples of yet another protein bar for the sports enthusiasts of Boulder. I was about to pass on by, but I heard the words “low glycemic index” . . . that stopped me. Little did that young man know that he was the inspiration for this week’s blog post. 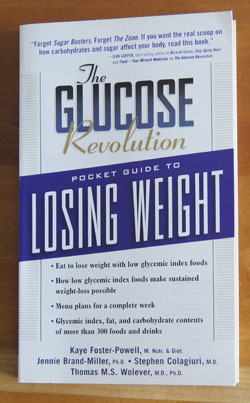 The Glucose Revolution Pocket Guide to Losing Weight is all about the “glycemic index” of foods. Why is the glycemic index important? Low glycemic index foods help stabilize blood glucose levels. Spikes in glucose are related to insulin levels, and thus to diabetes. For the dieter, low GI foods keep you feeling full longer. The Glucose Revolution Pocket Guide, page 9: “The glycemic index is a clinically proven tool in its applications to diabetes, appetite control and reducing the risk of heart disease.” One chapter gives sample diet plans, and another lists healthy snacking techniques. At the end of the book is a lengthy table of the glycemic index of many foods. How is the glycemic index of a food measured? The researchers recruit volunteers, feed them equivalent carbohydrate amounts of foods, then measure their glucose levels by sampling their blood over several few hours. All foods are compared with a reference food, pure glucose, which is arbitrarily assigned a value of 100. From the above examples, you see that foods that are not classified as carbohydrates such as peanuts or milk naturally have a low glycemic index (GI) value. Fruits in general are low GI. Legumes like garbanzos and kidney beans are low. Whole wheat bread has a GI of 53, while white bread has a value of 95. Sweet potatoes have a value of 54, while white potatoes have a value of 91. Kind of justifies the old “health food” adage that whole wheat bread is better for you than white wheat bread. Go for complex carbohydrates! International table of glycemic index and glycemic load values: 2002, Kaye Foster-Powell, Susanna HA Holt, and Janette C Brand-Miller, Am J Clin Nutr, 2002;76:5–56. glycemic load, or “GL” + (GI x the amount of carbohydrate) divided by 100.
International Tables of Glycemic Index and Glycemic Load Values: 2008, Fiona S. Atkinson, Kaye Foster-Powell, and Jennie C. Brand-Miller, Diabetes Care, 2008 Dec; 31(12): 2281–2283. I especially like the University of Sydney site because you can enter a food and find out both its GI and GL. It’s a comprehensive site that explains all that you might want to know about glycemic index. I am a big fan of The Great Courses, audio university-level lectures on a multitude of topics. Years ago I purchased “Nutrition Made Clear” by Roberta H. Anding; I highly recommend it. Dr. Anding discussed glycemic index in lecture 6, “Not All Carbohydrates Are Created Equal”, and lecture 22, “Metabolic Syndrome and Type 2 Diabetes”. She also referenced the 2002 J. Clin. Nutrition article by Foster-Powell, K. et al. What to cook for this blog? Since there are no recipes in The Glucose Revolution Pocket Guide to Losing Weight, I decide to cook a low GI/GL food and use it . . . somehow! I found some dried garbanzo beans in my pantry. Also known as chickpeas, they have a GI of 31 and GL of 9. I cooked a big batch in my electric pressure cooker. I will put these pretty beans in green salads and main dish salads (I have a great recipe for a Mediterranean salad). I can use them for hummus (I’ve made it many times before). 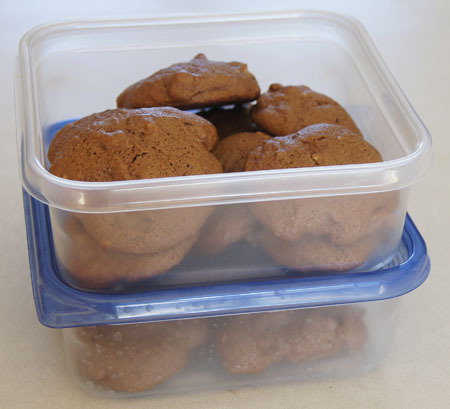 They freeze well, so I froze several containers for later use. 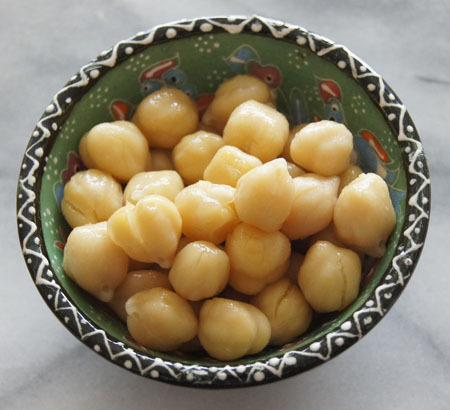 Garbanzo beans should be a healthy addition to our diet. 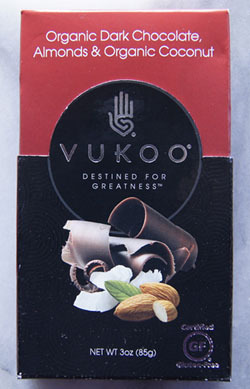 And what of the Vukoo bar? 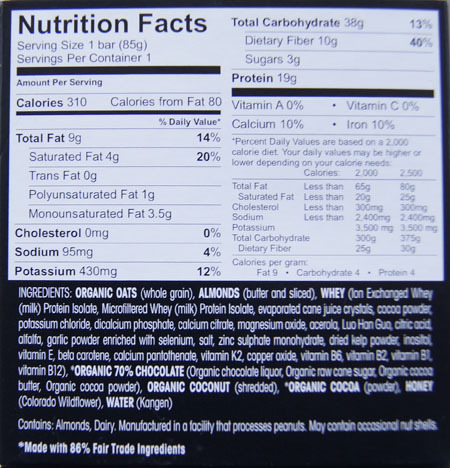 “Glycemic index” is not noted on the bar’s label. But the three major ingredients, oats (GL of 11), almonds (not a carbohydrate), and whey (a protein) do have low GL. The young man giving us samples claimed that half a bar kept one of his friends hunger-free for several hours. I found that little pieces of this bar kept me full between meals – it took me a week to finish it.